I know I can't possibly be the only new mom (can I still call myself a "new" mom 16 months in?) that struggles with finding time for maintenance. Things like trips to the salon, pedicures, brow and lip waxing, etc. In all honesty, I could find the time, but sometimes when I have 30 minutes free, I just want to sit on my couch in leggings and a t-shirt in the comfort of my home. The salon means looking decent, going out in public, and putting on something that is not covered in food your toddler threw on you lovingly smeared on you while refusing to eat. When BlogHer and Olay contacted me about reviewing the New Olay Smooth Finish Facial Hair Removal Duo, I agreed to test this uniquely formulated two-step system designed to gently, yet effectively remove unwanted facial hair, leaving skin smooth, conditioned, and visibly hair free. I was skeptical at first-how would my sensitive skin handle the product, and would it actually remove unwanted hair? When I learned the system contains a Skin Guarding Balm you apply before the Hair Removal Cream to hydrate the skin in order to minimize irritation and redness, my skepticism started to fade. After all, anything that allows me to feel more confident in my appearance, simplify my routine, and save time (hello comfy clothes and the comfort of my own home) is worth at least trying! 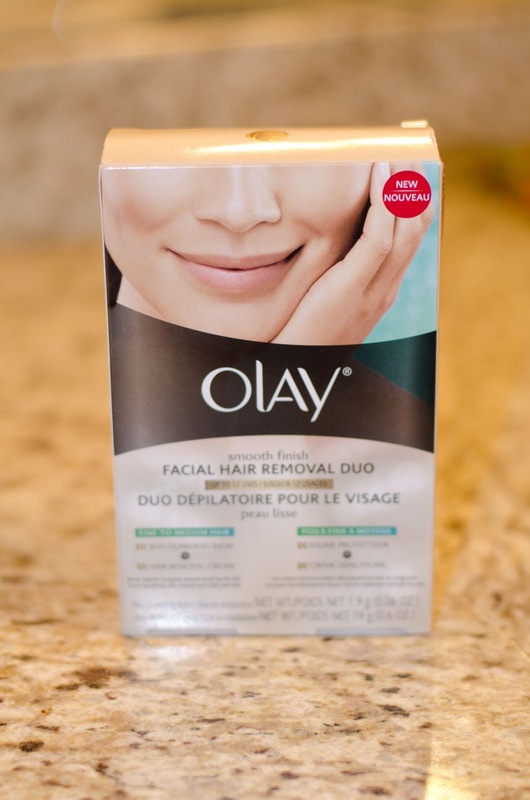 I was excited when I received my New Olay Smooth Finish Facial Hair Removal Duo and was eager to try it out! I expected complicated instructions and was pleasantly surprised by just how easy this hair removal is to use! You simply apply the Skin Guarding Balm, apply the Hair Removal Cream, wait 6-8 minutes, and gently wipe off! What? You don't take pictures while waiting for your hair removal to work? The best part? It works so, so well! I was shocked by how smooth my lip area was-and that sensitive skin I mentioned? It wasn't even the slightest bit red. I've had absolutely no irritation, which is unheard of for me when it comes to hair removal! Best of all, I was able to do all of this in the comfort of my own home after I put Kate down for the night! And, I still had time to make a microwave chocolate cake and sit my pregnant behind on the couch to relax. I am confident the New Olay Smooth Finish Hair Removal Duo will become a staple in my beauty routine! How awesome is that? You know what else is awesome? BlogHer and Olay are giving a $50 gift certificate to one lucky We're Finally Three reader! Leave a comment telling me how you express your inner beauty, and you'll be entered for a chance to win. This sweepstakes runs from 1/3/2012 - 2/3/2012. 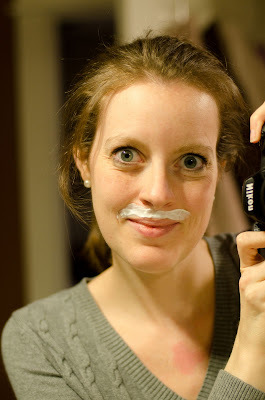 While we’re on the subject of looking good, you might want to check out the “Looking Your Best” posts in the Life Well Lived section of BlogHer.com. There are some great tips and expert posts! Since hitting 30 (3 years ago) and welcoming our daughter, the hair sitch is becoming ridiculous. I joke with my Hubs all the time that it may be time to call Ideal Image! Thanks for the info! May have to give this a shot! I express my inner beauty my helping others. I express my inner beauty through the smile on my face and happiness in my heart. I express my inner beauty by wearing lots of bright, happy colors! I love to put quotes on the walls all over the house. I express my inner beauty by organizing blood drives at my school & donating blood whenever I am able to! I express my inner beauty in making dinner from scratch (every now & then)! i might have to try this if it really works as well as you say it does! I express my inner beauty by being the best me I can be & living my life to the fullest while maintaining my core moral values. At times I fail, but that is when I am reminded that I'm not perfect and it's ok. I express my inner beauty by taking vitamins, moisturize, drink lots of water, and using my best smile! I express my inner beauty by making people have fun learning about pathology. And, as I read this, I'm contemplating the minor burn on my left upper lip from my hair removal yesterday....Hmm, skin saving balm sounds good! I express my inner beauty by being the best person I can be, and always being thoughtful and respectful of others. I express my inner beauty by being kind and helpful to others/strangers. I express my inner beauty by smiling! I express my inner beauty by letting the kindness in my heart show! Inner beauty... I need to work on that! Inner beauty to me is state of the soul. When I'm living right, I'm at peace with the world and I think that flows out of me in beauty, not just myself but the world around me too. I try to be good to myself and kind to others. I show inner beauty by smiling as much as I can! I express my inner beauty by helping people when I can by giving in my community and donating what I can thank you! I express my inner beauty by smiling and laughing. I express my inner beauty by trying to treat people with kindness and respect. i express my inner beauty by being myself! I express my inner beauty by caring the elderly friends when they are sick or too old that cannot go to our church, I visit them and sing Hymns with them. My beauty routine is quite simple. I avoid complicated process and am all for multi-purposed products. I like easy and simple. Less is more helps me express my inner beauty. I express my inner beauty, but giving a quick smile to those that I encounter that least expect it. Like a person driving by that expects a scowl, I do my best to smile at them. I strive to do all I can for the animals out there that need a loving 'furever' home! I express inner beauty by never letting other people get me down. I express my inner beauty by trying to be the best person I can be. I express my inner beauty by setting a good example in my behavior and my style of dress. I express my inner beauty by trying to always follow the Golden Rule - Do unto others as you would have them do unto you. I try to let my inner beauty shine by not covering myself with too much makeup, and also simplifying my accessories. When I look more natural, I feel more like my true self. I express by wearing colorful socks. Thanks for the review & giveaway! I express my inner beauty by helping others. I like to express my inner beauty by creating items to give to other people to bless them. I tweeted about this post- https://twitter.com/#!/psmomreviews/status/160490639409152000. I show my inner beauty by an honest smile. I really need to try this. As you age I think your eyelashes fall to your chin. If you call waking at 4 to feed the baby, re-waking up at 7 (in a puddle of drool 'cuz you slept on your face) and slapping lunches together as you fly into a fast shower, smearing tinted moisturizer on your cheeks as you flail wildly to get the least-wrinkled clothes on WHILE also brushing teeth, scraping off yesterdays eye makeup AND jiggling baby on hip with minutes to spare before shoving everything (minus the dogs) into a diaper bag that gave up zipping after 3 months and trying to make it to daycare and work that is 24 miles away..in 16 minutes-inner beauty, then I am EFFING GORGEOUS inside!!! i express my inner beauty by smiling at strangers and being as kind as possible. I express my inner beauty every time I am laughing and enjoying time with friends and family. I try everyday to help someone whether at work or home. I express my inner beauty by being kind to everyone and donating my time in my community. I express my inner beauty by wearing a smile, being nice to others and positivity. I express my inner beauty by always thinking about others and how my actions affect them! I express my inner beauty by treating others the way I would like to be treated, giving my heart & soul to my family everyday, & I love painting/drawing to express what I'm feeling on the inside. My inner beauty shined the most when I worked at a Cancer Center for 2 years, I loved my job, the way it full-filled me. Then I got sick and can no longer work. Funny how things work out that way. Now, I try to shine when I can. I express my inner beauty with my hair! My hair style can usually tell you what kind of day I'm having or how I'm feeling inside. A big fun up-do is a fierce day. A low simple bun is a demure day. And my hair down and wild is a crazy-out-of-my-way day! I express my inner beauty by helping everyone I can! I express my inner beauty by making sure I keep my mind and body happy so I can let it shine through! I express my inner beauty by acting and dressing as though I feel like a million bucks, even when I don't. Amazing how I can fool myself into feeling good! I express my inner beauty through swimming 3 times a week which energizes me and keeps me fit. I have to admit, having lost a lot of my OUTER beauty from illness...I did learn a lot about inner beauty. That comes through pushing myself through the day in trying to remain positive for my kids and husband. Gifting others with verbal praise is how I show my inner beauty. Without giving this, how do others close to you know how much you care and appreciate them just BEING!? If that is all I can give right now, it is nothing compared to what they have given me throughout this 10 year fight. I let my inner beauty shine through by keeping my routine clean and simple. I try to always keep a smile on my face, and a listening ear available to anyone who needs it! I express my inner beauty by being kind to people. I express my inner beauty thru my poetry, photography, and how I treat others around me! I express my inner beauty through acts of kindness. Trying to be a better person inspires me, and I express it through being kind to others, as well as to myself and my body. A lesson that's taken me a lifetime to learn. I express my inner beauty by being uncomplicated and simple – the same things that are inside of me. I don't use a lot of products which helps me to keep things simple. Well i take good care of myself and my family, this is how express my inner beauty, as for hair removal this Olay products seems to be nice, might try it. You have a great blog. I liked your blog. Discussion on hair removal was also good. I liked different method for hair removal. Know more hair removal product products/hair-removal.